Shadow of Man, gave a talk to TED Conferences LLC about her work in the Gombe. her international youth organization, Roots and Shoots. 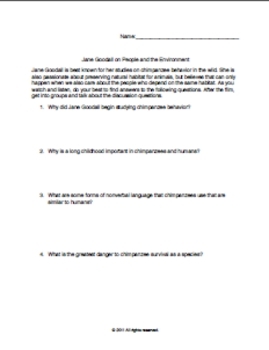 The talk fits well into an ecology unit as a discussion about human impact. So often information about human effects leaves students feeling hopeless. 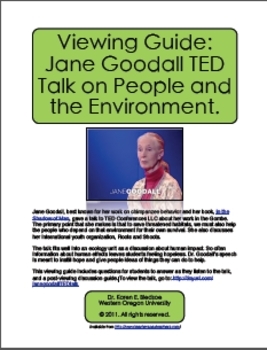 Dr. GoodallÊ¼s speech is meant to instill hope and give people ideas of things they can do to help. and a post-viewing discussion guide. Answer key is included.